1] "...there can be videos inadvertently out of synchronization by 3 seconds.But these things are total trivia. I don’t deal in trivia." 2] "Again, in the better videos, I saw a plane entering the South Tower exactly as I would have expected given Newton's Laws." 3] " I'm an author of 195 peer-reviewed and published papers, 113 of these as the principal author"
As with my previous post [about my short email exchange with the claimed video "expert" Ace Baker], these 3 quotes are the result of a brief e-mail exchange between myself and a claimed "NASA scientist". Quote  :"...there can be videos inadvertently out of synchronization by 3 seconds.But these things are total trivia. I don’t deal in trivia." Are details important for 9/11 researchers? Apparently not, at least not if you claim to be a scientist . Now, as a [none-scientist] layman , I have to say I'm "a little" confused here. I'd have thought that a person with scientific training/education would insist on examining "trivial" details which might escape the layman [ie myself] , but in reality, the reverse seems to be the case, as an alleged scientist's quote makes very clear. [And he's not the only alleged "scientist" with this same cavalier attitude, either. Another claimed "philosopher of science" has repeatedly stated words to the effect of "the 9/11 videos all look similar on initial, cursory inspection- therefor they are genuine" . This, despite the fact that it is possible, and has been since at least the early 1990's, to fabricate a film sequence of a plane in flight, or of a building demolition, entirely inside a computer, and that once published from one viewing angle, that same sequence can be "re-toggled" inside the computer and re-published with an entirely new camera perspective, allowing for multiple "prints" of a movie, all with unique camera perspectives]. It is perhaps worth remembering that neither of these two claimed scientists have laid claim to _any_ expertise/experience with video or photographic analysis for signs of fakery with regards to 9/11, nor for anything else, and yet regardless of this shortcoming on their part, both of "scientists" cavalierly dismiss detailed analysis of archived MSM footage and related imagery as a waste of your time, while simultaneously reminding you of their purported "scientific expert" status. 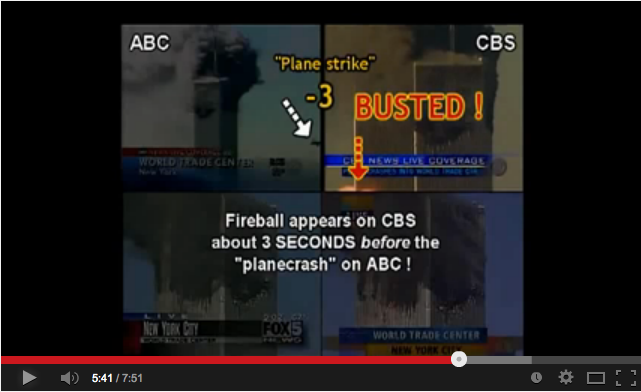 "Trivial" fact  : in the online MSM archives for 9/11, there is a 3 second discrepancy in the strike time for Fl.175 on CBS, versus 4 other MSM "live" feeds, despite the fact that prior to that strike, all 5 MSM stations are not only perfectly in synch with eachother, but also, for much of the time, are broadcasting the exact same "live" imagery at the exact same time! See: "9/11, Deja Vu, and "The Matrix"
"Pfft!" the "scientist" effectively says, "mere trivia, the plane image behaves in accordance with Newtons laws, therefor the MSM sequences are genuine" ; all the while common sense should tell us that there is something very wrong with such large time discrepancies. "Pfft" the "scientist" effectively says, "mere trivia, who cares about a 160ft plus difference in the strike zone- the plane image behaves in accordance with Newtons laws, therefor the video sequences are genuine" , while common sense indicates that the entry point for the plane should be the same in all videos. See: "Was Fl.175 Flying Level During Its Last 7 Seconds, Or Did It Dive Downwards Before Leveling Out? " "Pfft" the "scientist" effectively says, " mere trivia, who cares that in one sequence the last 7 seconds of Fl.175 involve a very steep descent, whereas in another sequence the plane is seen to be traveling parallel to the ground for the last 7 seconds in flight - the plane image behaves in accordance with Newtons laws, therefor the video sequences are genuine" , while common sense indicates that the flight path for the plane should be the same in all videos. "Scientist" quote : "Again, in the better videos, I saw a plane entering the South Tower exactly as I would have expected given Newton's Laws." The obvious "scientific" implication here being that because he believes that Newton's laws were obeyed in the various "plane into building" videos, this means that the videos depicting that 9/11 event [specifically Fl.175's alleged collision/penetration of WTC2] "must" be genuine. That of course, is a logical fallacy. Question for the "scientist": Is it impossible to entirely fake a video that obeys general laws of physics? Common sense says no, therefor, a researcher has to look for other signs [see above 4 "trivial" details], that the video is genuine; the mere appearance of conformance to certain laws of physics is not definitive proof of a videos authenticity. 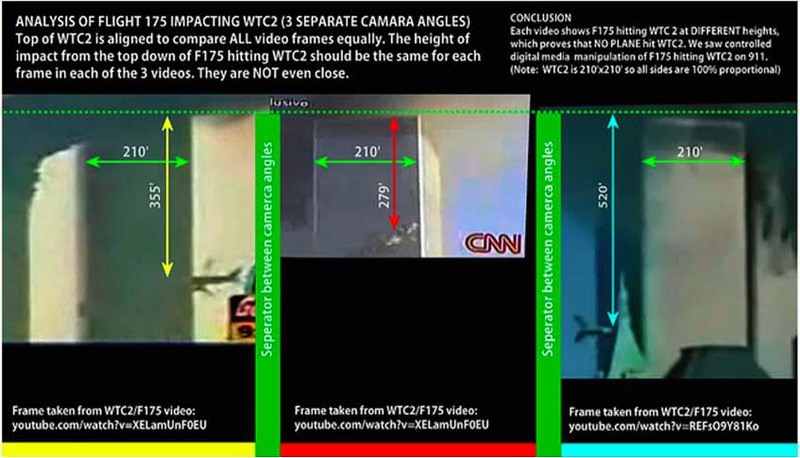 Of course, in flying "unmolested", in one piece, completely inside the WTC2 , common sense tells us that the plane image clearly _defies_ the laws of physics- it does not slow down by even one video frame throughout impact, and in fact takes the exact same number of frames to travel through air prior to strike as it does to completely disappear inside the WTC2! See: "Air versus Skyscraper"-The Shortest, Simplest, Most Devastating, Most Subversive 911 Truth Video?" Good News For Laymen/Simpletons - Forget Newtons Laws of Motion! Although I believe I understand the basic Newtonian Laws as applied to the events of 9/11, if you are a layman/simpleton like myself, I would claim that there is no need for you to ever have to try to understand Newton's Laws of Motion in order to understand the events of 9/11, nor to have to rely on any alleged "scientists" claims about them. "Again, in the better videos, I saw a plane entering the South Tower exactly as I would have expected given Newton's Laws." What Is The "Scientist" Really Saying Here? The twin towers were mostly constructed of steel girders and concrete, and weighed around 500,000 tons each , and 140 ton commercial aircraft have plastic noses and an aluminum skin around 2mm thick over an aluminum frame. 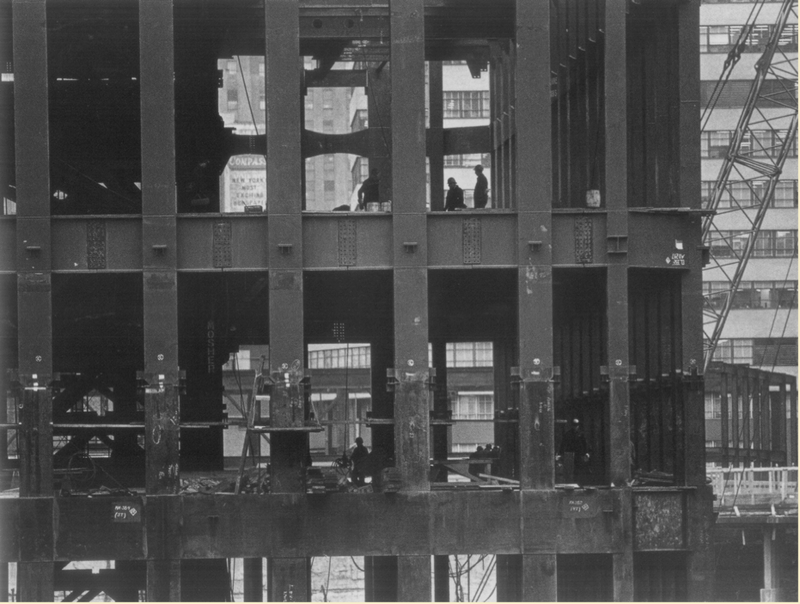 So all that the "scientist" is basically claiming here is that aluminum cuts right through steel, [and not just one steel girder, but multiple steel girders, simultaneously] . Common Sense From a Construction Worker[Me]: Aluminum Saw Blades DO NOT EXIST! l have worked on and off in the construction/housing restoration business for 30 years. That means I have both engaged in, and witnessed on a daily basis for 30 years, the cutting of various materials. As a plumber I have cut PVC [plastic] pipe, copper pipe, iron pipe, steel pipe, aluminum pipe, ALL with a steel-bladed hacksaw, hand held or otherwise, NEVER with an aluminum hacksaw blade. As a carpenter I have cut wood 2 x 4's, and aluminum door thresholds and other fixtures to size, plus 4" and bigger steel nails, ALL with either a fast rotating , hand held circular saw, a table saw, or a plain old saw/hacksaw - ALL using steel blades. _Never_ aluminum. FACT: THERE ARE NO ALUMINUM-BLADED SAWS USED IN COMMERCIAL CONSTRUCTION - because an aluminum saw blade would be too weak to cut plastic, wood, copper, iron, steel etc.! If you doubt my assertion, just go to your local hardware store and ask for a piece of plastic PVC pipe,, a piece of copper pipe, a piece of steel pipe, a piece of aluminum [such as a door threshold], or a section of 2" x4" wood to be cut to size, or just ask the guy who cuts any of those materials on a daily basis what the blade he uses is typically made out of. Or go to a a nearby construction site and just ask a carpenter, or his/her $8 per hr. assistant, what the blade they use to cut their materials to size is made of.
" I'm an author of 195 peer-reviewed and published papers, 113 of these as the principal author"
The implication being that you, dear reader, should abandon plain old common sense here, bow to this persons claimed superior knowledge and accept his assertion that aluminum skinned planes can indeed cut through multiple steel girders, despite the fact that in the real world, there are no aluminum saw blades in use. The "scientist" who is claiming that aluminum cuts steel is either an over-educated fool [ your tax dollars at work :-) ], or he is a fraud, a liar, a charlatan. Your choice to make, dear reader, not mine.